Get ready everyone! On Saturday July 25 from 12pm-4pm, we're hosting our second annual Belgian Beer Fest at the pub. Things are going to run a little differently this time. We will be selling "passports" instead of tickets this year so you get your passport stamped with each region you visit for beer. Each "passport" includes seven 4 oz pours of various Belgian beers. Check out the bottom of this page to get a preview of which beers we will be featuring. "Passports" are being sold for $25 each and we have limited availability so get them as soon as you can. "Passports" are only available to 21 years of age or older so if you don't have a "passport" you cannot participate or enter the Belgian Beer Fest area. Also with each purchase of a "passport" you get to take home a souvenir Middleton's tasting glasses. We will also have Belgian themed food so come hungry. The pub will be open to the rest of the public but you cannot enter the Belgian Beer Fest area without a passport. Click below to purchase your passports or buy them at the pub. If you are having trouble purchasing your Beer Fest passports through your Android device or another mobile device, try a computer or i phone and it should work fine. Sorry for the inconvenience. Since Belgian Beer Fest is only a couple days away, we will be sharing daily which Belgian brews we will have available. I'll even give you two for Tuesday. Here's a little info on De Garre from their website. "Staminee De Garre is located in one of the smallest streets of Bruges, the same alley De Garre. Tucked between two authentic buildings will find our rustic, historic and charming property . The Staminee is known and loved by tourists and residents of Bruges and distinguishes itself by the atmosphere and the classic feel evoked by the dark wood furnishings and classical music that we play. In our brasserie we serve delicious beers, 6 draft beers, abbey beers and cask ales. Also, bottled beers and Trappist beers can be found in our range. We pay up to three strong beers per person and show our love for quality beers by letting them into their value and nurture extra. Besides the 130 known and lesser-known beers we also offer other drinks and we serve hot and cold dishes . We are open on weekdays from 12:00 to 24:00 and on weekends from 10:00 to 01:00." A little info from the Chimay people. "Chimay Triple, with its golden colour, achieves a rare balance of sweet and bitter." "In the 18th century there was a very well-known brewer in the Dendermonde area. His name was Pauwel Kwak. He brewed his own beer, which was dark and heavy and also had a coaching inn on the road between Mechelen and Gent, where the mail coaches used to stop for a break. In those days, the Napoleonic Code ruled that coach drivers were forbidden to drink beer with their passengers and so they were not allowed to leave the coach to quench their thirst. Pauwel Kwak invented an efficient solution to this problem by offering the famous Kwak beer in a special glass that could be fixed to the carriage, so the drivers could also enjoy one. This story inspired a brewer from nearby Buggenhout and since the 1980s the Pauwel Kwak is brewed by Brouwerij Bosteels, which also produces the popular Tripel Karmeliet and the DeuS Brut des Flandres." "Pauwel Kwak has earthy aromas, a malty character with touches of liquorice, a nougat-like robustness and a warm finish not unlike caramelised banana. Yeast and red fruits are the strongest aromas, but you will also find a few herbs. The caramel is quite noticeable, together with the herbs and orange zest. The aftertaste is slightly bitter and herbal." "Launched 1982 by Jef Keersmaekers as Pater Noster. Brewed by Brasserie Du Bocq since launch. "CHOUFFE is an unfiltered blond beer which is refermented both in the bottle and in barrels. It is pleasantly fruity, spiced with coriander and tinged with hops. " "Magnificent aroma, delicate palate of raspberries with undertones of fruity acidity; elegant, sparkling clean taste, with inviting raspberry supported by lambic complexity. Deep reddish-purple color with pink head." "A Duvel is still seen as the reference among more full-bodied lagers. Its bouquet is lively and tickles the nose with an element of citrus which even tends towards grapefruit thanks to the use of only the highest-quality hop varieties. This is also reflected in the flavour, which is beautifully balanced with a hint of spiciness. Thanks to its high CO2 content, this beer has a wonderful roundness in the mouth. A Duvel is both the perfect thirst quencher and the ideal aperitif." "Originally called "Ouden Tripel", this ancient West Flanders Brown beer has found a new élan as a regional specialty under its current name: "VanderGhinste Oud Bruin". The main ingredients of our Vanderghinste Oud Bruin are malted barley, wheat, hops, water, and caramelized malts. These are used to brew a top-fermented beer. Flavour: Feels like the sound shot of alcohol is igniting the mouth. In reality the tongue and palate are warmed. The taste is characterized by its roundness. The aftertaste is strong, long-lasting and dry bitter. Colour and sight: Dark brown-red. A compact white-yellow, stable and lacing head. Scent: Touches of caramel, mocha and chocolate. Spices such as liquorice and coriander are also present. Flavour: Initially, a very good mouthfeel of alcohol and softness. This is followed by an increasing bitterness, partially from the hop, but also from the roasted malt and chocolate malt. Towards the end a nice balance between bitterness, sour and sweet. "Brewed using 40% soft wheat, Blanche de Bruxelles has a naturally opalescent colour with a very white, dense head.Coriander and orange peel added during wort boiling lend a slight but unobtrusive spiced nose. Although soft and smooth on the palate, as is typical of soft wheat beers, this light and well-balanced white beer is very fresh. Its complex aroma and modest alcohol content make Blanche de Bruxelles a beer like no other." "Reddish colour, almost like autumn leaves, very consistent texture with a slightly spicy aroma and an intense taste of caramel, fruit, and hints of raisins. It is only brewed about once per year, representing approximately 1% of total beer production, thus is quite difficult to obtain." "Yellowish-brown colour, with a more pronounced aroma, more fruits and a slight amount of Demi-Sec. This variety constitutes the largest proportion of production." "Dark brown color. Great strength balanced by a complexity of flavors and firm malt backbone. The bouquet covers a wide range: port wine, leather, apricots, oak, spices - a deeply intriguing beverage." "This beer has a white, smooth and very compact head. Its pale amber colour is very characteristic revealing a distinctive maltiness. It has a rich aroma with a unique combination of aromatic hops, spices and the typical bouquet of fermentation - very fruity. Secondary fermentation in the bottle gives it a unique aroma due to the presence of yeast. Whether served as a refreshing aperitif in summer or savoured during the winter months, the Triple is a connoisseur’s beer par excellence." "Triporteur From Hell is a dark beer brewed with hellish burned and roasted BOM malt. The beer reminds us of chocolate, caramel, recently brewed coffee and freshly baked bread. The wheat malt in the unfiltered beer can cause a slight cloudiness. The taste of Hell keeps evolving in the bottle." 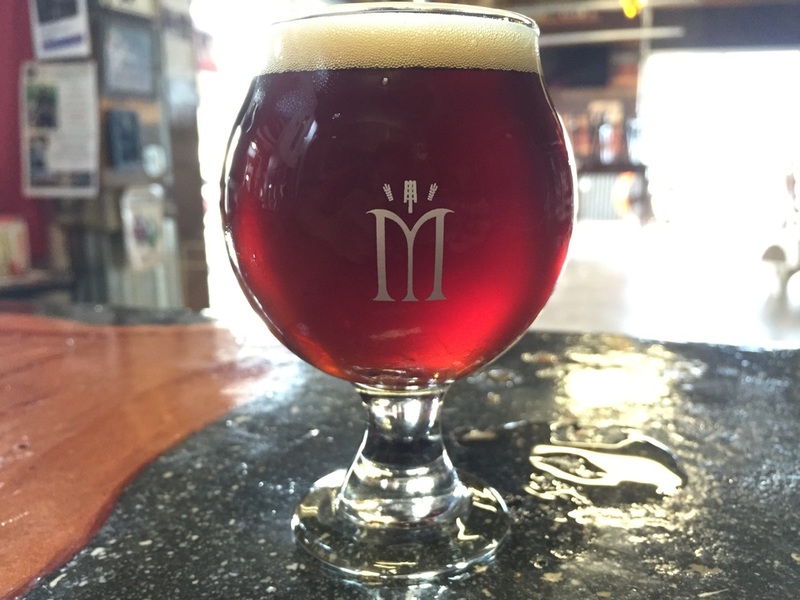 "Maredsous is the authentic beer of the Benedictine monks of the abbey of Maredsous in Belgium. The abbey is located in the Belgian Ardennes, south of the city of Namur, next to the picturesque village of Denée. At the abbey of Maredsous live, pray and work 33 monks according to the Rule of Saint Benedict. This tradition dates back to the 6th century. Dedication and hospitality are the most important values n the Abbey of Maredsous.The library, which contains more than 400,000 titles, some more than 1,000 years old, and the visitor center St.-Joseph embody these Benedictine values hat contribute undisputedly to the authentic taste of the Maredsous abbey beers. The Maredsous abbey beers are still brewed according to the original recipe of the Benedictine monks." "Westmalle Tripel is a clear, golden yellow Trappist beer that undergoes a secondary fermentation in the bottle (9,5% alcohol). It is a complex beer with a fruity aroma and a nice nuanced hop scent. It is soft and creamy in the mouth, with a bitter touch carried by the fruity aroma. An exceptional beer, with a great deal of finesse and elegance. And with a splendid long aftertaste. The Westmalle Tripel is indeed called the “mother of all tripels”. This type of beer was first brewed in Westmalle abbey in 1934 when the new brewing hall came into use. The current formula has stayed practically unchanged since 1956, thus more than 50 years. This beer is generally served in 33 cl bottles, precisely the volume of the accompanying glass goblet. The bottles are sold individually, in handy packs of six or in crates of 24 bottles. And of course this beer is served in the better horeca outlets. Tripel is also available in 75 cl bottles. It is remarkable that the beer matures differently in these larger bottles. The fruity aroma is somewhat softer and riper, and the beer gets a light touch of vanilla." "The RAW MATERIALS for Orval beer are spring water, two-row malting spring barley, aromatic hops and liquid candy sugar." "St. Stefanus Grand Cru was first brewed in the early 1990s and follows the traditional recipe of a ‘tripel’ brew. As a smooth, well-balanced specialty beer, Grand Cru is ideal to enjoy with food and adds an elegant touch to any occasion. St. Stefanus Grand Cru is a very smooth, well-balanced strong specialty beer, hazy gold with a sweet aroma of zesty grapefruit, lime and herby notes. On the palate, the beer is less sweet. The warming alcohol character balances perfectly with flavors of peach, banana, pineapple and pawpaw, finishing with a drying bitterness for a drink of perfect elegance, class and refinement." The first brewing of the Saison Dupont Dry Hopping dates back to 2010. This is a blond top fermentation beer with refermentation in the bottle, like the traditional Saison Dupont. The peculiarity of this special production, brewed in limited quantity, is that the hop used for the dry hopping is different every year. This year, three distinct types of hop were selected. For the dry hopping, the brews were produced with the hop “Minstrel” grown in England. The Dry Hopping is a copper-coloured blond beer, dry and thirst-quenching, with a sharp bitter flavour. It emphasises the beer’s fruity and floral notes. 1 Hopping technique from England"
"This is an American wild ale made by Picobrouwerij Alvinne in Belgium. It was fermented with house hops and yeast, and aged in Pomerol barrels for eight months. Golden blonde in color, with red fruit and wood notes barrel-aging." "The "Speciale Belge" beer style was created in 1904 for a brewing contest that was organized by the Universities of Belgium. The goal was to improve the quality of Belgian beer. The winner was a new style, called "Belge". Due to the success in the contest, a number of brewers decided to brew the style and called it "Speciale Belge". A "Speciale Belge" is pale amber in color (slighly darker than a pilsner) as brewers tried to copy the color of pilsner in a top fermenting ale. Later the color became darker as pilsners became very common to prove that the style is something special. After the second world war, when the quality of life in Belgium increased, several brewers created a "Speciale Belge" with a higher alcohol content, called a "Dubbel Special Belge". The beer has a big body, high effervescence, and a deep caramel flavor. There's a slight amount of yeast based sourness that creeps in to offer balance, with a flavor that reminds of dates or caramel covered apple. Today the "Dubbel Speciale Belge" no longer exists, the current higher gravity beer styles are trappist, abbey ales and so on. Therefore Brouwerij de Glazen Toren decided to recreate this special beer style. " "Scotch style top fermentation beer. It offers a finely wooded nose hinting at hazelnut, and is therefore distinct from traditional British scotches. It has a more rounded taste letting a discreetly full-bodied bitterness come to the fore, and will naturally seduce you." "In the fifties, an extraordinary meeting took place that all beer enthusiasts should raise their glass of Leffe to. The abbey’s Father Abbot Nys became acquainted with Albert Lootvoet, a master brewer. Passionate about the future of the brewery, Father Nys was upset to have to witness how, since the unpleasant stay of the French revolutionaries, the brewery had slowly fallen into decline and had eventually had to close its doors in 1809. Such a magnificent place could not be forgotten, he believed, and he vowed to bring the Leffe beer back. Father Nys and the brewer set about the challenge with vigour…and succeeded. Shortly after, the Leffe brewery was back in full effect. After Leffe Brown, a beer that shone brighter than the sun saw the light of day; they named it Leffe Blond – a beautiful chapter for Leffe indeed." "500 years of hard work went into making this beer that features the aroma of orange peel, coriander and herbs that the merry monks imported from sunny Curacao. Speaking of which: pouring Hoegaarden is just like letting the sun fall into your glass: light yellow and naturally murky. And the soft foam adds a cloudy finish. And then there’s the soft taste, light and slightly sweet and sour and with subtle citrus notes… ah, just go ahead and taste it instead of reading about it!"